Snap Camera - Lens Studio by Snap Inc. Snap Camera lets you apply Lenses to your face while using your computer's webcam. Utilize Snap Camera in your favorite third party live streaming or video chat applications by selecting Snap Camera as your webcam device. Refer to the links below to download and learn more about Snap Camera. When you build a Lens using Lens Studio, users will be able to unlock them in both Snapchat and Snap Camera. That said, there are somethings to be aware of when making Lenses that are intended to be used with Snap Camera. To unlock your Lens in Snap Camera, simply search for the Lens name in the Snap Camera search bar. If you just submitted your Lens, you might need to wait a short period of time before the Lens is searchable in Snap Camera. Lenses are rendered in Landscape resolution when using Snap Camera. If you are using only Face Effects, your Lens will likely work great because the content is tracked to the face and isn't dependent on device resolution. For any Lens that use elements attached to the screen like Screen Image and Screen Text, you need to make sure to account for the Landscape resolution in your design so your Lens looks great in Snap Camera. In Lens Studio, we first should test how are Lens looks in both Portrait and Landscape resolution. To do this, in the Preview panel, select the Device Simulation dropdown at the bottom of the panel. Then, in the dropdown, select Landscape. This preview mode will allow you to see how your Lens will look like in Snap Camera. Make sure to always test your Lens in this mode when creating Lenses that work great in both Snap Camera and Snapchat! Screen Transform allows you to add UI elements to the screen that are responsive to the device's resolution. The Screen Transform allows you to pin Images and Text to edges and corners of the device and also configure if the Image will be Fixed Width or Fixed Height. Refer to the Screen Transform guide for more information. Snap Camera allows you to trigger Tapped events via a keyboard hotkey. In the Snap Camera settings, users can configure this by assigning Trigger Lens Effect to a keyboard key or key combination. To add logic to the Tapped event. Create a new object with a Script Component. Make sure the Script Component is assigned to a script resource. With the object selected, in the Inspector panel, set the event dropdown to Tapped. This script's logic will now be triggered when the user taps the screen and also when the user trigger's the Lens effect via the Snap Camera hotkey. For more information on scripting, follow the Scripting Overview. Check out the Fullscreen template which allows you to transition between different Lens states via the Tapped event. This is a great way to incorporate interactions for Snap Camera users without writing any custom script. You can script your Lens to behave differently on Snap Camera vs. Snapchat. Use the below script, called isSnapCamera, to check if the Lens is running on Snap Camera or Snapchat. When using Snap Camera, the content is often farther from the camera than when using the same Lens in Snapchat. Because of this, you need to make sure your camera's far plane is adjusted to support content further away from the camera. To check this, select your scene's perspective camera. 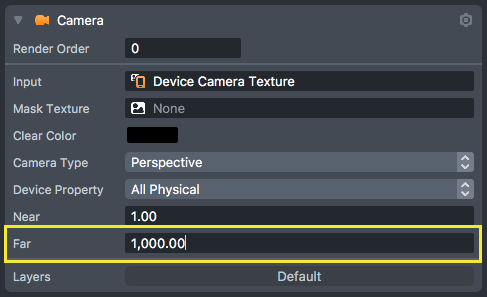 With the camera selected, in the Inspector panel, verify that the Far setting is set to 1000 or greater.